Artline Hi-Seal 430 Stamp Pad #2 - Stamp Pad Size: 2-1/8" x 3-1/2"
Artline Hi-Seal stamp pads come with a bottle of industrial ink that are formulated to perform under the harshest conditions encountered in today's manufacturing world. They are also refillable and are perfect for use on all non-porous surfaces. 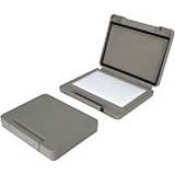 Our Industrial stamp pads use an air-tight lock to ensure a long life for the inking surfaces.